St Margaret & All Saints Catholic Church is on the northern side of Barking Road, close to the Oak Crescent turning in Canning Town. James McQuoin started work in the Victoria Dock area in 1856. An iron chapel was opened on the site in 1859 and Canning Town became an independent parish in 1870. The present building was consecrated in 1919. It was damaged by bombing during the war and restored in 1951, until which temporary premises were used on Chargeable Lane. St Gabriel's Mission Church was on Wellington Street (now lost, but close to, or the earlier name for, Stephenson Street, shown here. It started with an iron church about 1868 'between the River Lea and the railway, just north of Barking Road'. A brick building was consecrated in 1876, and gained a parish in 1879. It had a mission in Hermit Road (1896) and St Faith's Church in Clifton Road (1891-1920s). St Gabriel's suffered war damage and was demolished about 1955. Canning Town Congregational Church stood at an unidentified location on Barking Road, in an area of London which was heavily damaged by wartime bombing. The church originated in 1855 with services on Plaistow Marsh. In 1859 Swanscombe Street Chapel was built (see below). This was superseded in 1868 by the Barking Road chapel. It was badly damaged by bombing and was derelict from 1941. A smaller replacement chapel closed in 1959 after its patron's death. Canning Town (Primitive) Methodist Church stood at the south-east corner with Mary Street (formerly Swanscombe Street). It originated from the same source as the Congregational Church (see above). It was built in 1858-1859 and enlarged in 1861. In 1877, a new church for over 1,000 was opened in Mary Street. This was bombed about 1943 and was later demolished. 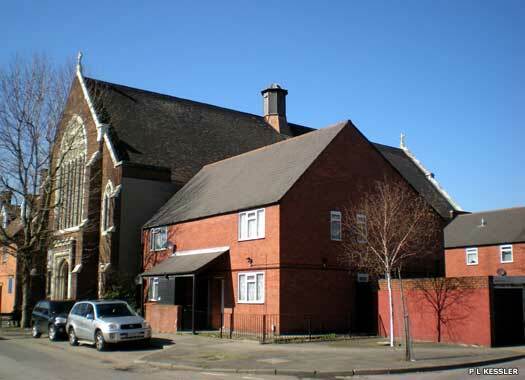 Barking Road (Wesleyan) Methodist Church was built in 1876, but closed during the 1960s. The Church of St Matthias stood at the north-west corner of Hermit Road and Star Lane. It originated in 1887, when the vicar of St Mary's Plaistow opened a mission in Garfield Road, helped by St Matthias' Church, Torquay. This was merged in 1906 with that of St Cyprian, Beaconsfield Road, which gained an iron church in 1896. In 1907 the church was built, but that building was demolished in the 1980s and St Matthias now holds services inside this modern replacement. Cliff Walk Evangelical Church is on the corner of Star Lane and Cliff Walk Road. 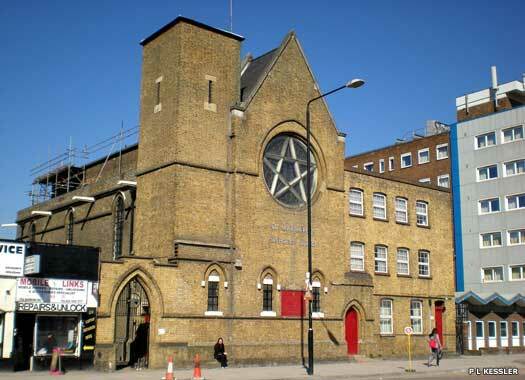 It was opened by the Peculiar People as Canning Town Evangelical Church, Cliff Street, about 1873. It was rebuilt in 1959. On nearby Star Lane, the German (Wesleyan) Methodist Church opened a small chapel in 1893 but the Germans left about 1914, as war loomed. 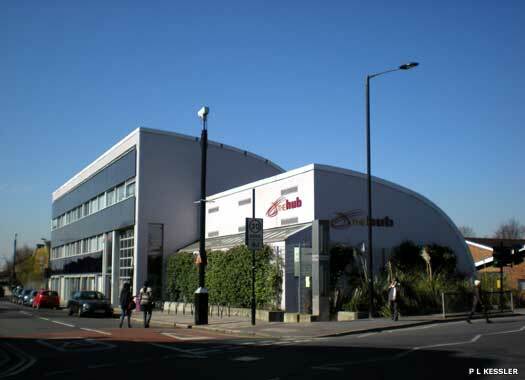 It was later Tyrell Evangelical Chapel and then the Peculiar People's Canning Town Evangelical Church until the 1930s. The Church of the Holy Trinity stood on the corner of Barking Road and Hermit Road. 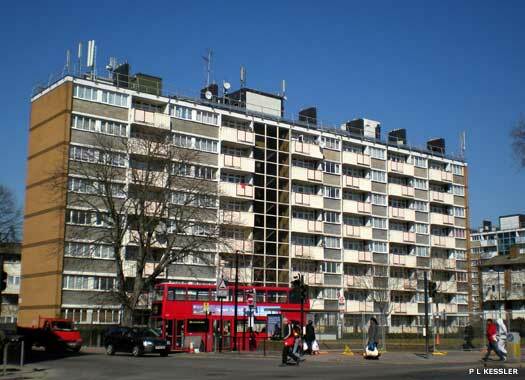 It originated in 1857 when St Mary's Plaistow helped form the Plaistow & Victoria Docks Mission for the rapidly-growing area formerly called Hallsville. 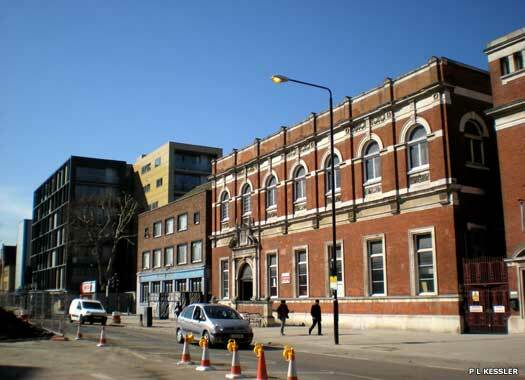 A new National School was built in Barking Road, which was also used for worship until 1867, when the church was opened opposite on the Hermit Road corner. It was Blitz-damaged and demolished in 1957 and replaced by Trinity Gardens. 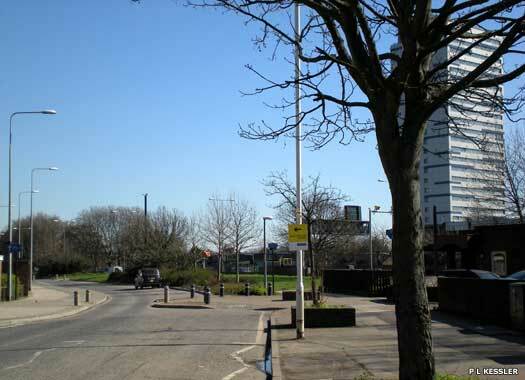 Ford's Park Church stood on Beckton Way. 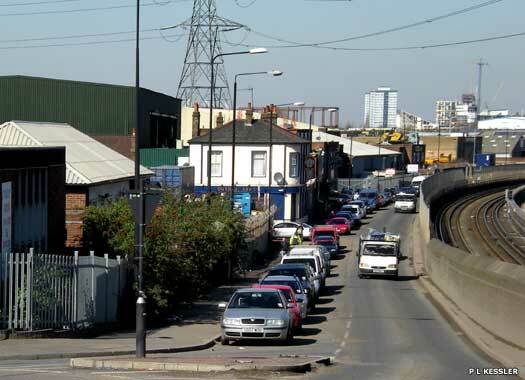 Much of this has since been subsumed beneath Newham Way, which cuts across Beckton Way in the distance here. As a consequence, the site of the church has been completely lost. The church was founded in 1894 by G T Allpress of Greengate. Services were held in a stable until 1904, when an iron building was erected. Although never strong the church continued steadily until it was bombed in 1940. The site was later sold. Keir Hardie (Primitive) Methodist Church lies between Fife Road and Plymouth Road. 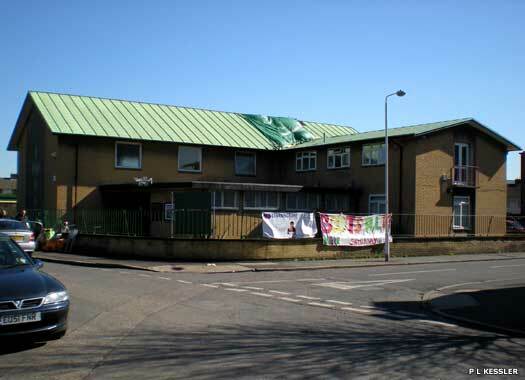 The church was founded as Fife Road Methodist Church, and was opened in 1960 in the West Ham district. 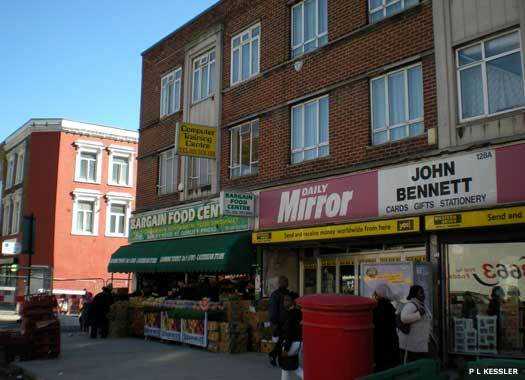 It replaced three older churches: Barking Road (see above), Shirley Street, and Custom House. The cost of Fife Road, which included a manse, was met partly by war damage compensation for Shirley Street. The church was later renamed for the now infamous estate in which it stands. River Church (Elim Pentecostal) sits at the corner of Vincent Street and Lawrence Street, with an exit onto Cooper Street. St Alban & the English Martyrs Mission Church opened here in 1894 and grew into the dockland settlement (Mayflower family centre). Its church was rebuilt in 1930 as St George & St Helena, before becoming an Elim church. 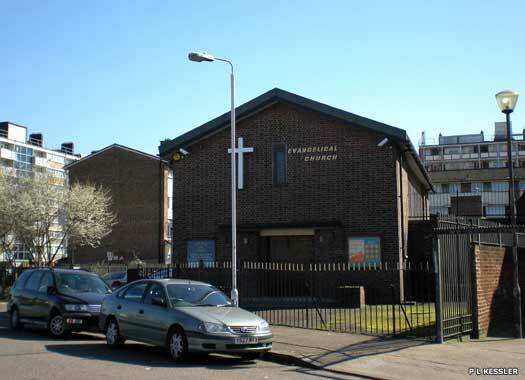 It is also known as Iglesia Cristiana de Newham. In 2011, Destiny Life Christian Ministries occupied an adjacent hall.